The distributor has introduced the world’s first U530 to include a Versalift (VOE36MHi Cat C) platform. Working with the vehicle supplier and body builder from the initial concept, they were able to ensure it was fit for purpose and meets the needs of those using it every day. Members of Northern Powergrid’s Transport Committee were also involved ensuring the necessary road safety legislation was obtained for this vehicle type. The electricity distributer also held a special training day for its hot glove linesmen to help familiarise them with the vehicle’s significant off-road capabilities and unique operating modes of the insulated boom by practicing operations on overhead lines at its Swillington training centre. As part of the day instructors from Mercedes Benz provided 1:1 tuition to the linesmen, ensuring that they fully understood the operating window of this vehicle. Alistair Walton, a zone manager at Northern Powergrid, said: “We have made a significant investment in this vehicle and it will play an important role in helping our hot glove teams work more effectively and safely and provide a 10 out 10 service for our customers. 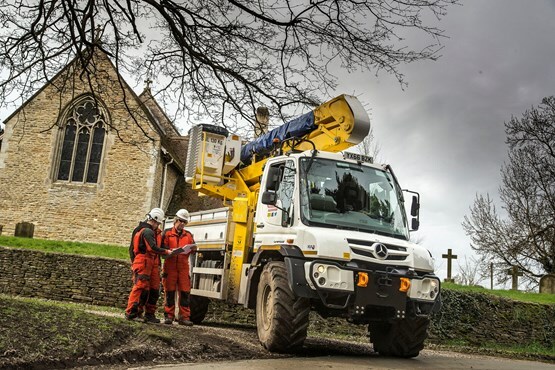 “The state-of-the-art features on the vehicle and its lifting platform empowers our teams to carry out work without having to disrupt electricity supplies for our customers and we can get to harder to reach areas on our network whilst minimising the impact on the environment.